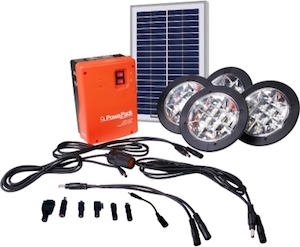 The Barefoot PowaPack Series offers a solar lighting solution for homes and businesses. The series includes longer lasting AGM sealed lead acid batteries that last up to 400 cycles – twice as long as previous Barefoot Power kits. The PowaPack 5W Bright includes the new 3W LED tube light which gives customers more light for the same price.